You’re going to have a ball when you’re camping and there will be lots of time for relaxation and play time. There will also be some work to do and some campers go home with a splinter or burn because they forgot to add gloves to their camping checklist. They don’t call camping “roughing it” for nothing and you can expect to get dirty and have your hands in picky, sticky, and hot conditions, every once in a while. There are a couple types of gloves to bring along. You should consider bringing a box of latex gloves for times when you are emptying your RV holding tanks, or some people like to use them when they are handling meat. These are handy because they are disposable. They are meant to protect your hands from germs more than anything and don’t cost much or take up too much room. Bring a pair of gloves for warmth for each person because mornings and evenings can be unexpectedly cool. It usually only lasts a day or two but these gloves can make you more comfortable on a chilly morning while you drink that first glorious cup of campfire coffee. You should have a few pair of heavy work gloves available as well. You can wear them when you are carrying wood, unloading camping gear, working on the RV, or if you have to use a shovel or axe. They will protect your hands from splinters and blisters while assisting your grip. 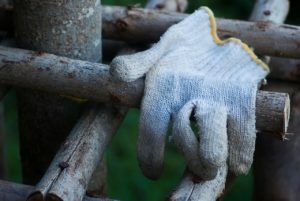 You can carry a bundle of wood without having the whole things drop like pick-up-sticks much easier if you’re wearing sturdy gloves than if you’re bare handed. You should also grab some oven mitts for cooking at the grill or stirring the campfire. These can both flare unexpectedly and the radiant heat can be quite warm. The mitts will protect your skin from burns and also the hair on your arms, too, which gets singed on a regular basis. We hope this helps you have a safe and happy camping trip this year. We look forward to seeing you around the campground. Be sure to call and make your reservation soon.